Kashmir is not only a gateway to an ideal honeymoon. Besides enjoying the sprawling lush green meadows that are dotted with colourful orchards and rich deodar and willow forest and crisscrossed by numerous water bodies one can discover Kashmir is just another hub for adventurers and thrill-seekers. The winding road cutting through the meadows that slowly turns to a narrow tricky and rocky path and bump into a notch is a perfect swing for a mountain biking tour in Kashmir. That’s make the difference where thousands goes for leisure holidays and few kick the pedals over rocky tracks and around boulder-strewn paths. Tourism in Kashmir, even after so many gun fires and blood battles, has evolved into a new theory of evolution of adventure activities. Since the inception of mountain biking in Kashmir, adventure tourism in Kashmir has ran through the nerves of global paddlers. It requires physical strength and stamina and more importantly A MISSION. A kind of sport it is that once you go for it, you are followed by several obstacles like rocky terrain and altitudinal and climatic changes. Mountain biking in Kashmir thus also requires strong mountain bikes that feature a rugged frame and fork. Also check the shock-absorber! The landlocked territory, which secludes a vast, rich and green valley, opens up several mettle tracks for the bikers that go over high mountain passes, notably the Banihal pass, Zojila Pass, Margan pass, and Smithan pass. The feeling of exhilaration comes as much from the bracing climate as from not knowing what you will see next… a row of hamlets, shepherds, water streams, paddy fields, woods, meadows or a village market. 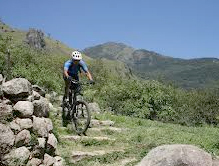 Equally mountain biking in Kashmir provides enormous thrill and challenge. Further, you must be geared up with necessities along with your sturdy mountain bike. ALONGWITH CARRY A MAP! The hot spots for mountain biking in Kashmir stretches from Srinagar to Gulmarg, Gulmarg to Pahalgam, Pahalgam to Srinagar, Srinagar to Sonmarg, Sonmarg to Wular or Manasbal lake and back to Srinagar. The Srinagar - Leh highway gives you a chance to conquer the mighty Himalayas pedaling through ten mountain passes, which is a freaking and challenging mountain biking tour in Kashmir. It occupies the mind of some REAL FREAKERS AND BIKERS. For the trio pedalers the perfect route is the roundabout tour from Srinagar to Pahalgam and back. Kashmir Mountain biking also allows you to camp at the serene site of the Lidder River where you can spend some ideal hours under the bracing mountain climate. Further, the strenuous ride over the Srinagar-Leh highway passes through high mountain passes and wings to Kargil followed by Khardung La at 5,340 meters. 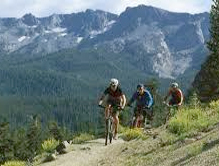 Before you hit either of the tracks, mountain biking tours in Kashmir must be fully prepared with a repair kit with tubes, non-toxic and water-soluble degreaser, grease tubes for greasing bearings and an aero spray for bike cleaning. A bike pump and tool kit, along with spare tyres, accessories like speedometer, bike rack, batteries, instruction manuals, maps and flashlights are other musts. Lastly, the best time to hit is in the summers.